Brainstorming is a method for developing creative solutions. It works by focusing on a problem and coming up with as many deliberately unusual solutions as possible and by pushing the ideas as far as possible. There is no criticism of ideas during the brainstorming session - the aim is to open up as many possibilities as is capable, and break down preconceptions about the limits of the problem. Once this has been done the results of the brainstorming session can be analysed and the best solutions can be explored either using further brainstorming or by other means. A facilitator should lead the session, initially defining the problem to be solved with any criteria that must be met, and then keeping the session on course. The facilitator should encourage an enthusiastic, uncritical attitude among brainstormers and ensure even participation by all members of the team. The session should be announced as lasting a fixed length of time, and the facilitator should ensure that no train of thought is followed for too long. The facilitator should try to keep the brainstorming on subject, and should try to steer it towards the development of some practical solutions. Brainstormers should be encouraged to have fun while brainstorming, coming up with as many ideas as possible, from solidly practical ones to wildly impractical ones in an environment where creativity is welcomed. Individual brainstorming tends to produce a wider range of ideas than group brainstorming, but tends not to develop the ideas as effectively, perhaps as individuals on their own run up against problems they cannot solve. Individuals are free to explore ideas in their own time without any fear of criticism, and without being dominated by other group members. Group brainstorming develops ideas more deeply and effectively, as when difficulties in the development of an idea by one person are reached, another person's creativity and experience can be used to break them down. Group brainstorming tends to produce fewer ideas (as time is spent developing ideas in depth) and can lead to the suppression of creative but quiet people by loud and uncreative ones. Individual and group brainstorming can be mixed, perhaps by defining a problem, and then letting team members initially come up with a wide range of possibly shallow solutions. These solutions could then be enhanced and developed by group brainstorming. Force Field Analysis is a method used to get a whole view of all the forces for or against a plan so that a decision can be made which takes into account all interests. In effect this is a specialised method of weighing pros and cons. Where a plan has already been decided on, force field analysis allows you to look at all the forces for or against the plan. It helps you to adjust the plan to reduce the impact of the opposing forces, and strengthen and reinforce the supporting forces. 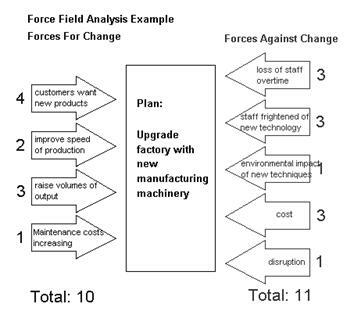 List all forces for change in one column, and all forces against change in another column. Assign a score to each force, from 1 (weak) to 5 (strong). Draw a diagram showing the forces for and against, and the size of the forces. Often the most elegant solution is the first: just trying to force change through may cause its own problems as e.g. staff can be annoyed into active opposition to a plan instead of merely not welcoming it. Force Field Analysis is an effective method of getting a picture of all the forces for and against a plan. It helps you to weigh the importance of these factors and assess whether a plan is worth pursuing. Where you have decided to proceed with a plan, carrying out a Force Field Analysis helps you identify changes that might be made to improve the plan. PMI stands for 'Plus/Minus/Interesting'. PMI is a basic decision making tool. When you are facing a difficult decision, you can simply draw up a table with headings of 'Plus', 'Minus', and 'Interesting'. In the column underneath the 'Plus' heading, write down all the positive points of taking the action. Underneath the 'Minus' heading write down all the negative effects. In the 'Interesting' column write down anything unique about the action or any extended implications of taking the action, whether positive or negative. You may be able to make a decision just from the table you have drawn up. Alternatively, consider each of the points you have written down and assign a positive or negative score to each appropriately. The scores you assign can be entirely subjective. Once you have done this, add up the score. A strongly positive score indicates that an action should be taken, a strongly negative score that it should be avoided. The table and scoring method for PMI is less common than just a basic analysis of pro’s, con’s and interesting points drawn in the form of a three-armed mind map. This method is better suited to groupwork, where a round can first produce the plusses and subsequent rounds the other headings. It is important not to let contributions in the round stray from the heading as a free-for-all can dilute the effectiveness of the process of discovery. Should I move to the big city? SWOT Analysis is an effective method of identifying your Strengths and Weaknesses, and to examine the Opportunities and Threats that you face. Often the analysis using the SWOT framework will be enough to reveal the changes that can be usefully made. Consider this from your own point of view and from the point of view of the people you deal with. Don't be modest, be realistic. If you are having any difficulty with this, try writing down a list of your characteristics. Some of these will hopefully be strengths! Again this should be considered from an internal and external basis - do other people perceive weaknesses that you don't see? Do your competitors do any better? It is best to be realistic now, and face any unpleasant truths as soon as possible. Where are the good chances facing you? What are the interesting trends? Carrying out this analysis will often be illuminating - both in terms of pointing out what needs to be done, and in putting problems into perspective. Plan how you would use the opportunities to build on the strengths and/or overcome the weaknesses. Prioritise action on the threats.